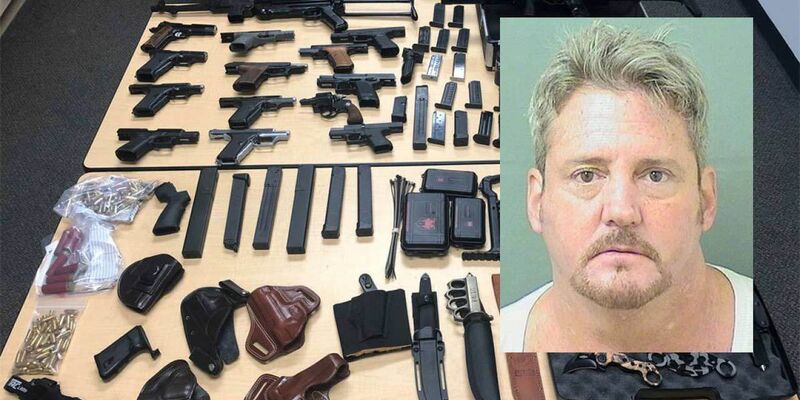 TEQUESTA, Fla. -- A Tequesta man was arrested on Thursday after barricading himself into his residence with a weapon and his stepdaughter. On March 21, at about 10:54 p.m. Tequesta police responded to a residence in the Tequesta Oaks Community for a domestic disturbance call. While on their way to the scene, officers were informed that the suspect said "if the police is called, I'll shoot up the place." Upon arrival, officers learned from the man's wife that Robert J. Goldstein was armed with a firearm and barricaded himself, along with his step-daughter who was suffering from an unknown medical condition. Goldstein is a convicted felon. Due to the imminent danger of the victim, officers entered the house and ordered Goldstein out of the bedroom and downstairs, which he complied. He was arrested without resistance. While speaking to Goldstein, officers were made aware of more firearms in the house. Officers were unable to access a safe due to Goldstein not knowing the combination. Robert J. Goldstein was charged with domestic battery with strangulation and convicted felon in possession of firearms. Tequesta Police contacted ATF West Palm Beach Field Office to coordinate executing a search warrant and search the home for additional firearms, ammunition and bomb making materials. Goldstein was arrested in 2002 by Bureau of Alcohol, Tobacco and Firearms on federal charges of possessing illegal explosives. In 2002, Goldstein had paperwork in his possession indicating he was planning on causing harm to a Muslim Mosque or school and also a list of Islamic Centers in the Tampa Bay area. The investigation continues. More information will be added it as it becomes available.